Very good interview! I can’t believe you brought back names like Hector Wagner and Jim Campbell :). Guy Hansen was very well liked and respected in Puerto Rico as a member of the Mayaguez Indios. Great baseball guy! 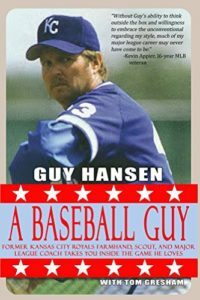 I have TWO connections with Guy (Rock) Hansen… I was born in KC — my earliest memory is going to a KC A’s Bat Day when I was 3 yrs old; I was thrilled when the Royals came into the league. My family and I remember when Rock was drafted and served as a Royals coach. The 2nd connection I have is that my son, Zack, has had the privilege of working with Rock in his barn. Rock is sooooo amazing at connecting with kids and getting them to understand not only the mechanics of pitching, but how pitching can help develop an overall love for the game AND how pitching can develop a self-confidence that can carry over into school and relationships. He’s absolutely incredible!